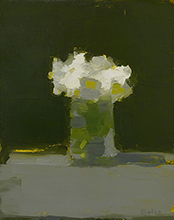 Stanley Bielen's paintings have been compared to the late still life's of Edouard Manet. 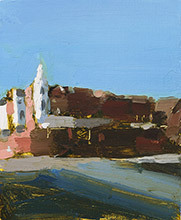 The works are loose, brushy interpretations of the subject matter rather than attempts at photographic realism. 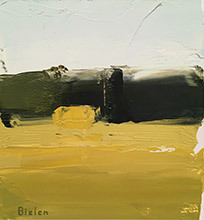 "Bielen's elegant oil on paper paintings [are] steeped in quiet contemplation. 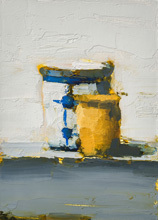 An intimacy is felt regardless of whether he is handling a still life or a landscape. The painter is masterful in capturing dramatic half-light, while employing loose strokes of translucent color from his simple yet seductive palette." Stanley Bielen was born in Rzeszow, Poland. He studied at the Pennsylvania Academy of Fine Arts. 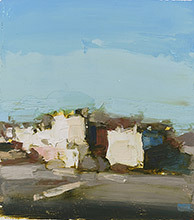 He currently lives in Philadelphia and teaches at the Fleisher Art Memorial of the Philadelphia Museum of Art. 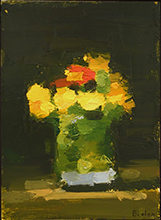 Bielen's work is part of the collections of the Hirshorn Museum, CBS Television and Goldman Sachs. He was the recipient of the 2003 Fred and Naomi Hazell Faculty Fellowship at the Samuel S. Fleisher Art Memorial of the Philadelphia Museum of Art. 5 1/2 x 4 1/2"
5 1/2 x 4 7/8"
5 1/2 x 5 1/8"